Copenhagenize.com - Bicycle Urbanism by Design: How Much Do You Ride? 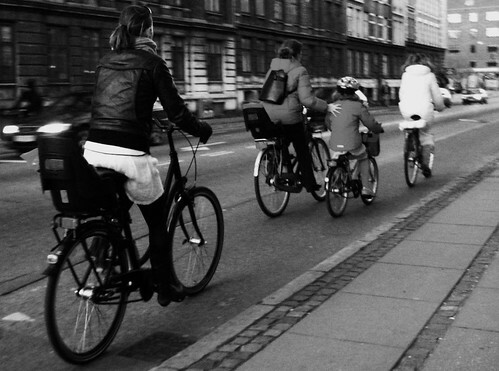 A classic Copenhagen bike lane with Copenhageners doing what they do best. We found a spot of statistics from Eurobarometer about how many kilometres a year citizens of EU countries ride bikes on average. There is a massive difference between top and bottom. Netherlands and Denmark on top... hardly a surprise. For us Finland's very respectable finish is a pleasant surprise. Nice one. Ireland, too. A bit surprising that the UK is so far down the list with a paltry 81 km a year, considering the impressive push for bike culture in the country. The figures for USA and Canada are nothing to write home about, either. But there are so many bike advocates in certain cities over there that this number is sure to rise. All in all, these numbers have to rise. There is so much focus on urban biking these days. Everybody wants to "Copenhagenize" their cities. So much good energy in London, Zürich, Munich and many North American cities. Norway plans on doubling the amount of trips by bike by 2015 and Sweden has plans on drastic increases, too. Even Denmark in general, and Copenhagen in specific, are actively working towards increasing ever aspect of biking. Work to be done, all around. Good luck to all involved.